The desired product of the Southern Forest Futures Project is a mechanism that will help southerners think about and prepare for future changes in their forests and the benefits they provide. Because any single projection of the world’s (or a region’s) biological, physical, and social systems has a high probability of being incorrect, the Futures Project instead examines a range of possibilities–also called scenarios or futures–that describe the forces influencing forests. Its scope is defined by an extensive public input process and insights of an expert panel and then narrowed into a practical number of futures through modeling and analysis. This chapter describes the development of the alternative futures considered for the Southern Forest Futures Project and the ones selected for detailed analysis. Because they play such a prominent role, we begin with a definition of what is meant by a “future:” each future is a comprehensive and coherent (internally consistent) combination of varying climatic, demographic, and economic changes in the southern region; by simulating these changes, we can forecast likely impacts on the amount and characteristics of forests. Within the context of this effort, the futures are used to evaluate how forest conditions and interrelated ecosystem services might change over time, and how those changes might affect forest functions, values, management, and policies. Together, the set of futures represents the full range of possible trends and changes to southern forests driven by social, economic, and climatic forces. The futures are analyzed with the U.S. Forest Assessment System, which is also used for national and regional assessments for modeling responses of land use, forest harvesting, forest development, and forest disturbance to changes in key economic, demographic, and climatic variables. At the national level, the U.S. Forest Assessment System is the primary tool for evaluating several climate and timber-market scenarios for the 2010 Resources Planning Act (RPA) Assessment conducted by the Forest Service, U.S. Department of Agriculture (USDA Forest Service 2012). RPA scenarios describe forecasts of conditions in U.S. counties, most often “downscaled” from published global scenarios (IPCC 2007). Some important issues could not be analyzed using our modeling framework, either because models were not available within the framework or because available knowledge could not be formalized into an explicit set of model variables. We addressed some of these issues by coupling forecasting work with expert knowledge and results from previous research; for others, we employed models that were outside the framework. Although analyses are informed by the forecasts, these “meta-issues” draw much of their information from a careful synthesis of the scientific literature. Each meta-issue is addressed in a separate chapter of this publication. We used a multi-stage process to choose a practical number of futures that represent a range of factors likely to determine the future conditions in southern forests. Public meetings, conducted in 14 locations to gather input on a broad set of resource issues in the South, drew more than 600 participants (Wear and others 2009) and identified a large number of concerns and issues (chapter 1). The stage was set by an overview of the Futures Project and its links to other resource assessment efforts [in particular, RPA and the Intergovernmental Panel on Climate Change (IPCC) assessments]. The panel was briefed on the public input, which had been organized into broad categories representing seven forces of change: economic, social, institutional, land use, forest management, biological, and physical. The panel discussed, clarified, and expanded on the public input. They were asked to speculate on how each force of change might play out in the future and to define a list of alternatives for each of several influential factors (such as population and bioenergy demands). This list was distilled by combining similar ideas and forming a short list of what the panel deemed to be the most important factors likely to drive change. We next reviewed the public input and the list of factors from the expert panel meeting to determine how they could be addressed within the Futures Project, given data and model limitations. Some of the factors identified by the expert panel were not suited for quantitative analysis within the modeling framework, but could be addressed using science synthesis and technical analysis through the meta-issue analysis. After careful deliberation, we specified a strategy for addressing each of them. We then examined scenarios that had been developed for use in other assessments to determine whether any could be applied to the Futures Project, this in recognition of the difficulty and high cost, both in dollars and time, of developing futures for key driving variables. When key variables interact within a constructed future, such as ours, coherence is difficult to maintain; for example, economic futures have implications for energy consumption and therefore for emissions and climate projections. Based on these considerations, we selected the 2010 RPA scenarios, which are in part based on IPCC scenarios, as a starting point for developing futures. Using these scenarios provided “downscaled” and detailed forecasts of key driving variables—including population, income, and climate changes. In some instances, we modified scenarios to address specific issues raised for the Futures Project. The resulting large number of possible futures was impractical for detailed and timely evaluation, so we conducted a preliminary analysis to define a smaller, more manageable set—we call these “Cornerstone Futures”—that represent the range of future conditions from the full set while eliminating essentially redundant ones. Our primary data source is the set of more than 2,000 comments collected through public meetings, webinars, and online input. These are described and synthesized in Wear and others (2009). Raw data and issue aggregations are also available on the Web at http://www.srs.fs.usda.gov/futures/input/received/. Several key determinants of the future of forests and forest benefits in the South were identified based on the synthesis of the public input. For each of them, the expert panel defined alternative views of how the future might unfold over time. Each was evaluated as to whether it would be possible to evaluate the alternative views using inputs to the U.S. Forest Assessment System and related models. Four met this criterion: emerging bioenergy demands, land use changes, forest products markets, and climate change. The remaining six (forest insects and diseases, invasive plant species, water, taxes, forest ownership, and fire issues) could not be addressed using the modeling framework but would be evaluated as part of meta-issue analysis. The alternatives considered (where applicable) as well as the analysis strategies chosen for each are listed below. Bioenergy—The emergence of new markets for renewable energy was expected to have great potential for shifting forest conditions and uses in the South. Driven by various policies, bioenergy uses of wood could be influenced by demands for cellulose in biofuel production or for wood chips to be burned in power plants or to make fuel pellets. Three alternatives for increased biofuels demand were considered: (1) demand grows for wood-based cellulose for liquid fuels, (2) demand for cellulose in liquid fuels is limited to agricultural inputs, and (3) demand grows for wood chips in power plants and for wood pellets in heating. Demand for wood and agricultural feedstocks as renewable energy sources can be compared within the U.S. Forest Assessment System by adjusting market activity (harvests) to reflect emerging markets. However, bioenergy-focused policies could increase demand to a level that causes broad-scale structural changes in timber markets, resulting in scenarios that exceed the limits of our analytical models. This suggested a combination of approaches. The first was to include a moderate expansion in demand for bioenergy as a part of the package of alternative futures. The second was the use of additional models to address the potential for structural market changes. In addition, the bioenergy analysis needed to examine the various production and policy uncertainties surrounding this issue and to inform additional modeling with insights into technological constraints and alternative demands (chapter 10). Forest products markets—Although bioenergy represents a new and uncertain element, forest product markets have long influenced the use and condition of southern forests. With the South producing about 60 percent of all wood products in the United States (Prestemon and Abt 2002, Wear and others 2009), the expert panel saw a need to evaluate alternative wood products futures based on the possibility that the retraction of pulp and paper markets and the ongoing shift from lumber and plywood to engineered solid wood products will continue. From these possibilities emerged two alternative scenarios for timber demand: (1) an increase driven by new technologies in engineered wood products, biofuels, and a stable pulp and paper sector; or (2) a decrease driven by declines in paper production or by traditional wood product uses as wood becomes replaced by other materials. Alternative futures for wood products demands can be evaluated within the U.S. Forest Assessment System by adjusting production levels for the region, using either market models or simple price forecasts. The evolution of the wood products industry in the South documented by Prestemon and Abt (2002) provides a foundation for forecasting alternative market futures within this well-defined marketplace (chapter 9). Land uses—The scoping process identified population growth, development, and changes in the timber and agricultural sectors as the key driving factors driving land uses in the South. The expert panel viewed these as dynamic and advised analyzing a range of future developments in land use. The analysis yielded two major issues: (1) urban expansion affected by population growth and income changes, and (2) changing demand for cropland driven by bioenergy or food markets. The land use models in the U.S. Forest Assessment System are designed for forecasting alternative trajectories of urban development in response to population and income forecasts. In addition, changes in rural uses are simulated in response to changes in the values of agricultural and forest values. We incorporated land use forecasts as part of the alternative futures and addressed specific questions regarding the future of land uses in the South. In particular, questions about altered urbanization footprints require an analytical future approach and chapter 4 is dedicated to discussing land use futures and uncertainties. Climate—The expert panel identified climate change as a key driving factor and a source of uncertainty for the future of southern forests. Alternative climate forecasts from the IPCC analysis provide a range of futures for the key variables (temperature and precipitation) that could be considered within the Futures Project. The panel also raised questions that may not be precisely captured by the U.S. Forest Assessment System models: (1) the effects of climate changes on extreme weather events and fire, and (2) the role of forests in sequestering carbon as part of a national mitigation strategy. A set of climate forecasts defined by existing models can be examined within our modeling framework: the U.S. Forest Assessment System was designed to address the impacts of climate changes, and the RPA scenarios provide a library of climate scenarios from several general circulation models (GCMs). We also designated climate change as a meta-issue so that key uncertainties and implications beyond those addressed by the U.S. Forest Assessment System could be fully examined (chapter 3). This publication also addresses climate change effects on carbon stored in forests (chapter 5), wildlife (chapter 14), and fire (chapter 17). Insects, diseases, and invasive plant species—The expert panel identified insects, diseases, and invasive plant species as driving factors in determining the future of southern forests. Insects and diseases have long been the focus of forest health concerns in the South, with increased threats from nonnative species defining a key area of uncertainty for forest sustainability. Over the past 20 years, nonnative invasive plant species have also become a growing concern. The spread of cogongrass, paulownia, Chinese privet and other highly invasive species was raised at public meetings throughout the South. The rate of spread for these species, the potential for new species introductions, and the plausibility of controlling existing and new species are highly uncertain. Invasive species effects cannot be directly evaluated within the structure of the U.S. Forest Assessment System. They may represent novel structural changes to forest systems. We addressed this issue through two meta-issue analyses: one addressing nonnative invasive plant species (chapter 15), and the other addressing insects and diseases (chapter 16), which updates an earlier analysis of Ward and Mistretta (2002). The former explores the potential influence of climate changes on invasive species spread rates and ranges. Water—Both the demand for and supply of water in the South was seen as a driving factor for the future, largely through its impact on acceptable forest management practices. Water availability could also have an eventual impact on the scale of urban development and thus would necessarily affect forest extent and condition. The expert panel raised questions about the effects of population growth, urban development, and increased drought frequency and severity; and mitigating effects of new technologies and conservation. Although water demands as described by the expert panel could eventually have an impact on land uses, for example in metropolitan watersheds, these demands would be localized and are not amenable to developing alternative futures for modeling within the U.S. Forest Assessment System. The primary analysis of these issues is contained in a meta-issue analysis (chapter 13), which included linkages of the U.S. Forest Assessment System model outputs to a water supply and demand model to predict the effects of land use conversion and timber harvesting on southern water supplies (Sun and others 2008). Taxes—The influences of taxes on forest management, ownership, and parcelization have long been a concern for private forest owners, and this issue was raised consistently at the public meetings. The public asked questions about the design of “conservation-neutral” tax policy and speculated about the impacts of changes to inheritance, property, and income taxes on forest conditions. The future of tax policy was seen as important in determining future ownership and management. The impacts of various tax policies cannot be directly addressed within the U.S. Forest Assessment System. Instead, tax issues are examined as a meta-issue (chapter 11) using a literature synthesis. Fire—Fire can be an important management tool and an undesirable occurrence in the forest, depending on timing and location. The public raised concerns about the future feasibility of fire management amid the challenges of urbanization and climate change, and the implications of climate change for future wildfire extent and patterns. of fire issues employs wildfire risk models linked to the climate forecasts used in the U.S. Forest Assessment System. Forest ownership dynamics—Recent changes in forest ownership—especially the shift from forest industry to Timber Investment Management Organizations (TIMOs) and Real Estate Investment Trusts (REITs)—portends changes in forest management and conditions. What is more, several trends in the demographic makeup of nonindustrial private forest owners foreshadow potential changes in ownership and forest uses. All have implications for future forest conditions and sustainability. Because of the high degree of uncertainty, forest ownership is another area that cannot be directly modeled. Instead a meta-issue analysis examined trends in ownership and owner attributes, the causes of historical changes in broad owner categories, and the range of implications from ongoing changes in ownership (chapter 6). This issue is linked to forest taxes (chapter 11) and land use changes (chapter 4). The U.S. Forest Assessment System provides the modeling framework for the analysis, and we considered driving factors in terms of this model’s inputs. Market futures were driven by price forecasts with prices increasing as timber products became more scarce, decreasing with less scarcity. For constructing the futures we conceptually bundled bioenergy and forest products market futures. That is, expanding demands could reflect strengthened markets either for bioenergy or traditional wood products. Land use models within the U.S. Forest Assessment System are designed to be driven by population and income projections. Climate variables enter the projection of forest conditions affecting forest type distributions and forest productivity. Since the U.S. Forest Assessment System had originally been designed to develop the RPA Assessment, we began by evaluating whether the existing RPA scenarios were adequate for addressing the issues of the Futures Project. Although based on IPCC worldviews, the RPA scenarios also contain data and detail relevant to conditions in the United States–specifically, climate and socioeconomic projections, downscaled to the county level (USDA Forest Service 2012). The IPCC fourth assessment (IPCC 2007) is the global basis for the RPA Assessment because it provides an internally consistent set of scenarios that offer a broad spectrum of potential futures from which the RPA analysts could select a subset that was most relevant for U.S. forests. The IPCC directed a special report to generate scenarios of greenhouse gas emissions, set within four broad storylines about future economic, demographic, political, environmental, and technological change (Nakicenovic and others 2000). The A1 storyline describes a future of very rapid economic growth with a global population that peaks in mid-century, and then declines. The A2 storyline describes a continuously increasing global population and economic growth that is more regionally oriented. Population growth for the B1 storyline is the same as A1, but B1’s economic future describes a rapid change towards a service and information economy, with a strong emphasis on clean and resource-efficient technologies. The B2 storyline describes a growing population and intermediate economic growth, but a preference for local solutions over global integration. Data compatibility issues limited the RPA scenarios to the A1, A2, and B2 storylines. Furthermore, RPA adopted the A1B storyline with its assumptions regarding energy futures. For each of the IPCC storylines A1, A2, and B2, the 2010 RPA scenarios provide unique forecasts of population and economic growth, downscaled to the U.S. county level to the year 2060. For the A1 storyline, the IPCC developed several sub-storylines that were used to depict different futures of energy use and technology. For the 2010 RPA analyses, the A1B set was chosen. The storylines were used as input to modeling systems that generate estimates of GHG emissions, which in turn were used to run GCMs that provide alternative climate forecasts. The 2010 RPA analyses used results from three GCMs for each storyline, resulting in nine potential climate futures. The GCM data were downscaled using a statistical approach to the 0.5 arc minute and then aggregated to the county scale (Coulson and others 2010). For the A1B and A2 storyline, the GCMs are the MIROC, CSIRO, and CGCM models, while for the B2 storylines they are the Hadley, CSIRO, and CGCM. The GCM projections were generated as changes from simulated historical monthly means (1961–90) for each GCM (Joyce and others 2011, Price and others 2011). Basing forecasts on the simulated values corrects for differential biases of the GCMs at the fine scale used for analysis. Change forecasts were then applied to historical data to generate the projections. Monthly mean daily max and min temperatures, precipitation, along with other variables not used in the Futures Project’s analysis were generated to the year 2100. Note, however, that Futures Project impact analysis was limited to a 50-year analysis (2010–60). The RPA scenarios, then, provide a set of futures defined by three GCMs for each of three storylines. Land use models within the U.S. Forest Assessment System define change in forest area (and other uses) in response to the economic variables from the storylines as well as timber and crop prices (Wear 2011). Forest dynamics models forecast changes in forest conditions in response to harvesting (which in turn are influenced by the economic variables) (Polyakov and others 2010), and to changes associated with aging, disturbance, and climate (Wear and others 2013). These RPA scenarios therefore directly address a range of futures identified as important land-use and climate driving factors by the expert panel. We decided that the RPA climate data provided an adequate (and the only practical) range of climate scenarios for the Futures Project. We also decided that the land use forecasts, driven by alternative population and income forecasts, provided an adequate range of land use scenarios for the Futures Project. Two other forces of change identified by the expert panel—forest harvesting and management to supply bioenergy and other wood products markets—could be evaluated within the structure of the model. In the U.S. Forest Assessment System, we can address alternative scenarios for wood production in two ways. One is to apply alternative projections of prices for forest products to forecast changes in harvesting. This “price-exogenous” approach, although simple, allows us to simulate increasing and decreasing scarcity in markets without specifically addressing market dynamics and wood-products demand structures. The other approach is to incorporate explicit models of market demands for various forest products within the modeling system, which for the RPA scenarios is the U.S. Forest Products Model (Ince and others 2011). The Forest Products Model was chosen for the RPA scenarios because it can incorporate demands for all classes of U.S. wood products within a global marketing framework (Raunikar and others 2010) and can be driven by variables taken from the same storylines. For our development of alternative futures, we used exogenous price forecasts, in particular, three “price-exogenous” scenarios: constant timber prices, increasing prices (plus 1 percent per year), and declining prices (minus 1 percent per year). Increasing prices describe an increasing scarcity of timber products and therefore can be applied to two possible futures: a shortage in available timber supplies or an increased demand to satisfy existing uses or emerging uses such as bioenergy. Decreasing prices reflect decreasing scarcity consistent with a contraction in demands for products (such as pulpwood for paper production) or a rapid expansion in supplies derived from intensive management. We use the 1-percent increase and decrease rates to bookend the analysis of markets because they are consistent with real price growth over the expansionary phase of southern timber markets from the 1980s through the 1990s. Layered on the analysis of futures, we also conducted an analysis of future wood products/bioenergy markets to provide insights into how specific market developments might play out and to define additional analytical futures for evaluation. For our initial set of alternative futures, therefore, we started with the RPA scenarios for forecasts of climatic and socioeconomic conditions, and then applied the three alternative timber market scenarios, three socio/economic storylines, three GCMs, and three timber market scenarios. None of the resulting 27 initial futures were considered more likely than the others. Rather, each was judged to be within the realm of plausibility. While each scenario likely contained some unique insights into future resource uses and conditions, it was necessary to select a smaller subset of the futures for detailed analysis and discussion within the Futures Project. In this section, we briefly touch on some of the variables forecasted with the U.S. Forest Assessment System to describe the logic behind selecting Cornerstone Futures. Thorough discussions of forecasting approaches and forecast results are contained in chapters 4 and 5 and in several supporting documents. To begin defining the set of Cornerstone Futures to be used for detailed analysis within the Futures Project, we conducted the U.S. Forest Assessment System land-use, forest-condition, and timber-harvesting simulations for the initial set of 27 alternative futures and applied various metrics to compare the resulting forecasts. This process was complicated because the alternative futures are ranked differently depending on which variable is used to construct the ranking—for example, the same future might forecast the greatest loss of forest land and a median level of future biomass (estimated as growing stock volumes). Timber prices—We started by dropping the set of futures with constant prices; in every comparison, these futures yielded forecasts that were intermediate between futures with increasing and decreasing prices, meaning that the increasing and decreasing price futures bracketed the constant price futures for all variables evaluated. This step reduced the number of alternative futures to 18. Biomass volume and land use—We next used two highly aggregate metrics to compare forecasts across the remaining futures: total volume of biomass by broad forest type and total area of forestland. We held the GCM constant (CSIRO) for storyline/timber price scenarios and displayed volume forecasts to 2060 for all growing stock and then for hardwood and softwood growing stock. Total volume follows a broad range of trajectories across futures (fig. 2.1). Increases are only expected for the B2 storyline with low prices (resulting in lower harvesting), which has the lowest urbanization (lower population growth and moderate income growth). All other futures result in expansion of biomass through 2030 or 2040, followed by declines. 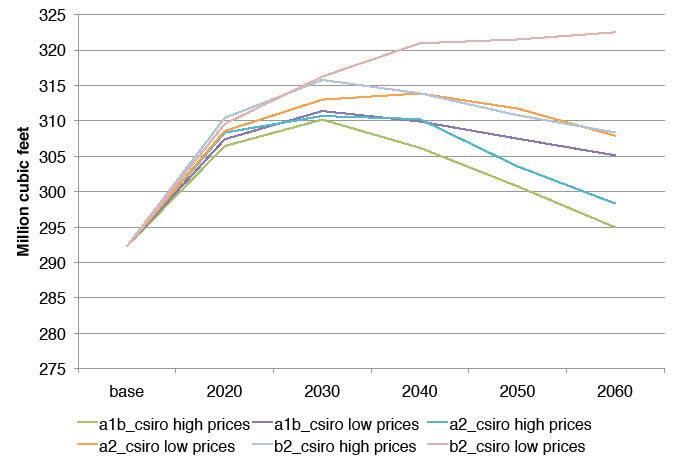 The future with the lowest biomass in 2060 is defined by the A1B storyline (moderate population growth and high income growth) combined with high timber prices. 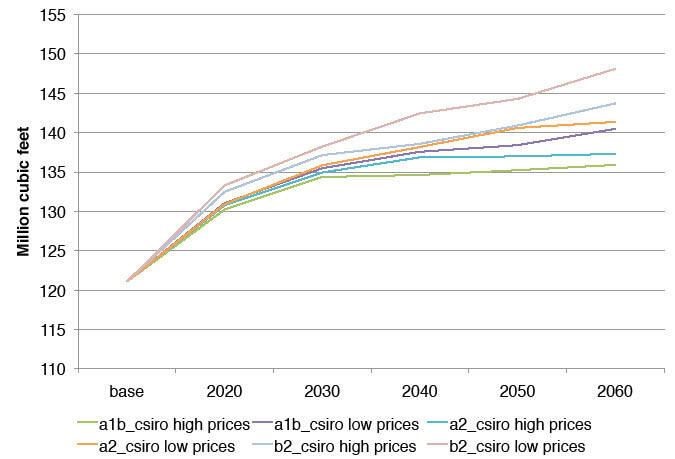 Figure 2.2 shows that softwood volumes increase to 2030 but then either level off (A1B/high prices) or increase through 2060, with the highest rate of increase for B2/low prices. Hardwood volumes are projected to decline after 2030 for all futures except B2/low prices, with the largest decline for A1B/high prices. Figure 2.1—Forecasts of total growing stock volume in the South by alternative futures, 2010 to 2060, defined by permutations of storylines (A1B, A2, and B2) from the 2010 Resources Planning Act (RPA) Assessment and increasing and decreasing timber prices. All futures use the CSIRO general circulation model’s forecasts of the associated climate. Figure 2.2—Forecasts of (A) softwood and (B) hardwood growing stock volume for the South, 2010 to 2060, defined by permutations of storylines (A1B, A2, and B2) from the 2010 Resources Planning Act (RPA) Assessment and increasing and decreasing timber prices. All futures use the CSIRO general circulation model’s forecasts of the associated climate. Forest area is forecasted to decline in response to the economic/population forecasts from the storylines and the timber price futures (by construction, land use is not directly responsive to climate). Low population and income growth reduces urbanization and consumption of forest land. In addition, high timber prices discourage deforestation. Therefore, the B2 storyline (moderate income growth) coupled with high prices yields the smallest loss of forest land by 2060, and the A1B storyline (rapid economic growth) coupled with low prices yields the greatest loss of forest land (fig. 2.3). With the storyline held constant, low prices yield more forest loss than high prices. Because the A2 storyline is intermediate to the A1B/high forest loss and B2/low forest loss and was intermediate in the biomass volume forecasts (for all climate projections), it was dropped from the cornerstones. 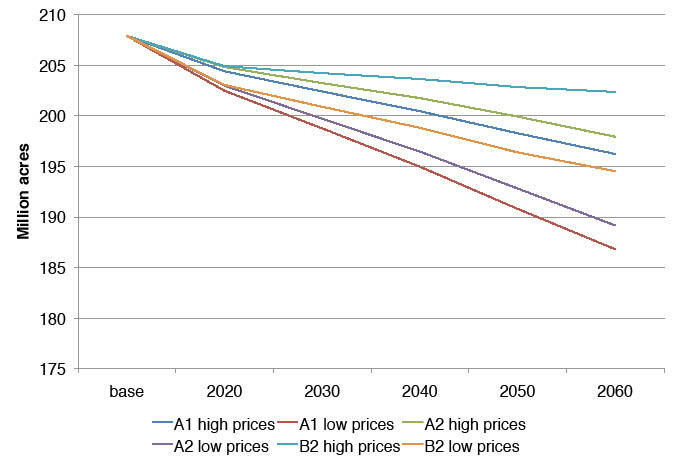 Figure 2.3—Forecasts of total forest area in the South for alternative storylines (A1B, A2, and B2) from the 2010 Resources Planning Act (RPA) Assessment and price scenarios (increasing and decreasing). Note that land use forecasts do not vary across general circulation models. So an analysis of the range of outcomes for these two variables suggests inclusion of four futures for consideration. A high economic-growth/increasing timber price future (A1B/high price) and a low growth/decreasing price future (B2/low price) bracket the projections of total forest biomass. 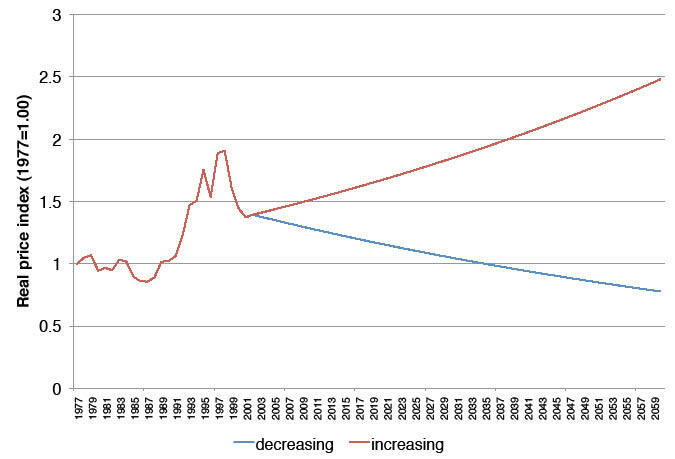 For forest area change projections, the brackets are a low economic-growth/increasing timber price future (B2/high price), which could reflect less globalization (more isolated nation economies) and increasing U.S. scarcity of wood products in the face of less trade; and a high growth/decreasing price (A1B/low price) future, which could reflect a shift in timber production offshore to support global economic growth (or simply a decline in the demand for forest products). Climate—The ranking of the futures with respect to total biomass and total forest area does not vary across GCMs, as is shown by a follow-up evaluation of the biomass variable. 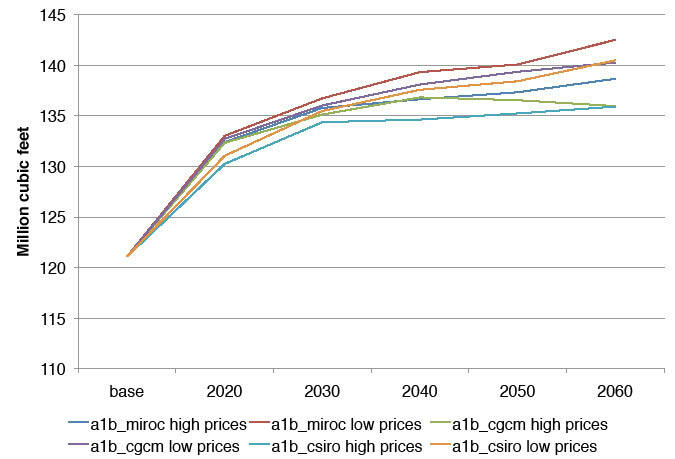 Figure 2.4 shows forecasts of growing stock volumes for the three GCMs associated with A1B storyline, low and high timber prices (MIROC, CSIRO, and CGCM). Clearly, the trajectories of growing stock volumes cluster strongly around the price futures with much less variation among the GCMs within each price cluster. 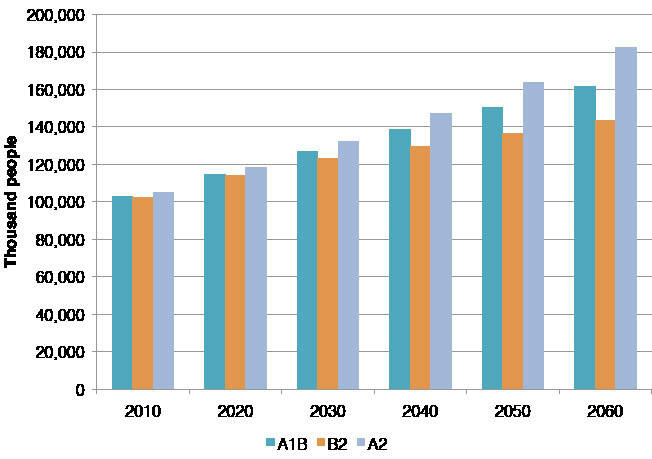 Figure 2.4—Forecasts of (A) softwood and (B) hardwood growing stock volumes for the A1B storyline, 2010 to 2060, defined by the A1B storyline from the 2010 Resources Planning Act (RPA) Assessment and either increasing or decreasing timber prices. 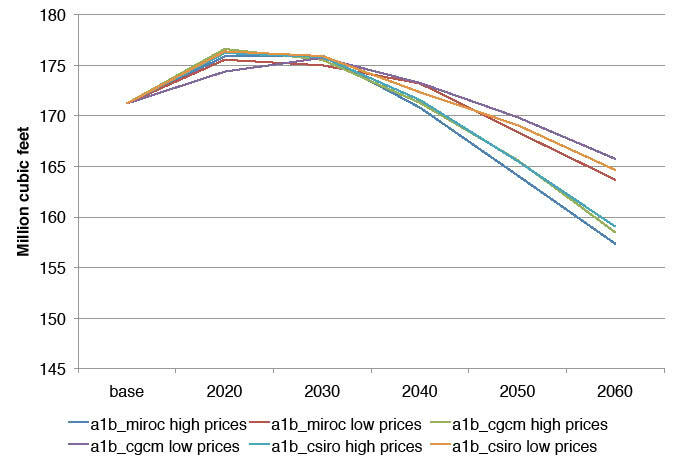 Forecasts are generated using CSIRO, CGCM, and MIROC general circulation models. We concluded that the timber-price and storyline effects overshadow the effects of climate variation. We were, however, reluctant to eliminate climate variation from consideration, primarily to account for any spatial variations that may be masked by the aggregate outcomes. 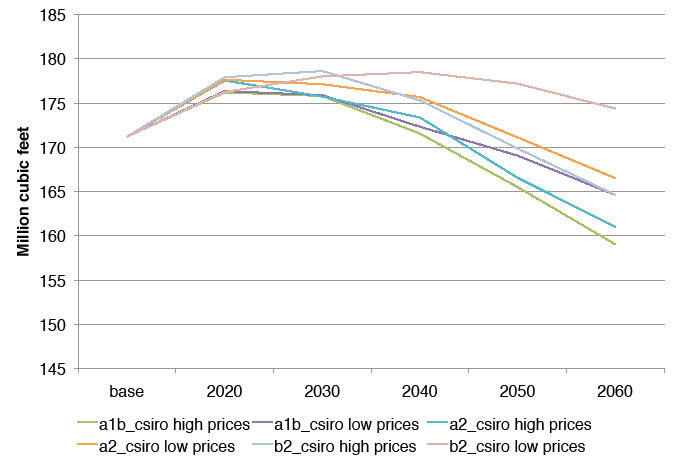 Accordingly, we introduced climate variation by assigning different GCMs to the four cornerstones identified above: MIROC to A1B/high prices, Hadley to the B2/low prices, and CSIRO to the A1B/low prices and B2/high prices. These models were selected to provide a variety of spatial expressions of the climate projections (MIROC for example, is generally warmer than the other models, but these differences do not significantly affect the projections of aggregate forest conditions). The implications of any spatial variations are discussed in the evaluation of various meta-issues, especially for wildlife (chapter 14) and fire (chapter 17). Tree planting—A review of the four remaining futures indicated that forecasts of forest investment, a key element in the development of the South’s forests since the 1950s, did not respond to variations in market futures. This led us to expand our scope to address this dynamic in a way that was consistent with our modeled changes in timber markets. To address the effects of forest planting, we augmented the U.S. Forest Assessment System with a simple model which assumes that current plantations will be replanted after harvesting and that a specified portion of other harvested forests will be planted. These assumptions derive from historical rates of planting for each of the 13 States and from expert advice on the likely path of future planting. The planting rates adopted for these baseline assumptions are more moderate than the aggressive expansion of plantations in the 1990s, and thereby reflect economic conditions and trends in the 2000s. Because planting rates are tied to harvesting (which controls the availability of forests for planting) and to land use changes, the area planted varies somewhat across simulated futures. We adjusted this baseline projection approach to introduce broader variation in the planting rate and to reflect the assumptions about future timber markets. The result was two additional futures. For the first, we increased forest planting rates in harvested areas by 50 percent from base rates for the A1B/MIROC/high price future; this yields planting rates that are higher than for other futures but not as high as was experienced in the 1990s—they would be plausible in light of observed nursery capacity and forest management. For the second, we decreased planting rates by 50 percent from base rates for the B2/Hadley/low price future; this yields a very moderate increase in forest plantations that level off after about 2030. Figure 2.5 shows the six Cornerstone Futures in a diagram that emphasizes their key variables. Cornerstones A through D are defined by the matrix formed by intersecting RPA/IPCC storylines A1B and B2 with increasing and decreasing timber price futures. Cornerstones E and F depart from these four by either augmenting the planting rates in Cornerstone A (E) or by decreasing the planting rates in Cornerstone D (F). 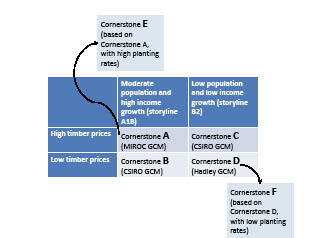 Figure 2.5—The six Cornerstone Futures defined by permutations of storylines from the 2010 Resources Planning Act (RPA) Assessment, three general circulation models (GCMs), and two timber price futures; and then expanded by evaluating increased and decreased forest planting rates. Storylines vary in their projections of population density (fig. 2.6). A2, the storyline not used within the Cornerstones yields the highest population growth with an 80 percent increase from 2006 to 2060. Lowest population growth is associated with B2 (40 percent growth) and A1B is bracketed by the two (60 percent). Because urbanization is also fueled by income levels, A1B, with its strong economic growth actually results in the greatest urbanization and greatest losses of forest area (chapter 4); B2 results in the lowest urbanization and forest losses. Figure 2.7 shows population density growth, by subregion, for the A1B storyline. In 2006, the Piedmont had the greatest population density (about 250 people per square mile or ppsm), followed by the Coastal Plain and Appalachian-Cumberland subregions with intermediate densities (100 to 150 ppsm) and the Mid-South and Mississippi Alluvial Valley with the lowest densities (75 ppsm). This general trend continues over the projection period, with growth strongest on the Piedmont (an additional 150 ppsm). 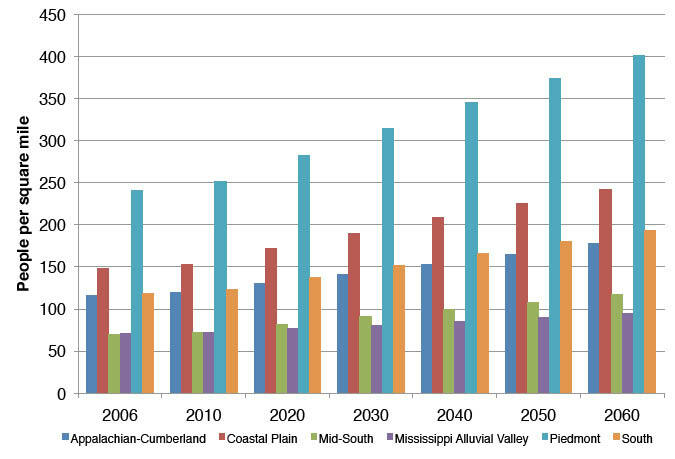 By 2060, the population density in the Coastal Plain would be as high as current population densities in the Piedmont. Figure 2.7—Projections of population density, 2006 to 2060, by southern subregions (people per square mile of total land area) for storyline A1B from the 2010 Resources Planning Act (RPA) Assessment. Even within the subregions, population change is not evenly spread. Forecasted population growth from 2006 and 2060 (fig. 2.8) shows that several areas are expected to experience population declines. This includes parts of the High Plains in Texas and Oklahoma, much of the Mississippi Alluvial Valley, and parts of southern Alabama and Mississippi. Population growth in the South is clearly organized around major metropolitan centers—especially Atlanta; Miami; Houston; Dallas; Washington, DC; Nashville, TN; and Charlotte and Raleigh, NC. Figure 2.8—Projection of population change for the (A) A1B and (B) B2 storylines (change in people per square mile) from the 2010 Resources Planning Act (RPA) Assessment. Note that counties in green have forecasted population losses. Cornerstone Futures are also framed by timber market projections over the next 50 years. These projections do not account for short run business cycles or the pattern of economic recovery from the recent recession but attempts to capture some long-run potentials for market development beyond this period of adjustment. Price forecasts defined by the Cornerstone Futures anticipate an orderly progression, either increasing or decreasing in real terms at 1 percent per year from a 2005 base. That year, prices were below their peak values from the late 1990s, especially for pulpwood-sized material (fig. 2.9). We also held the real returns to agricultural crops constant through the period. Because future markets could depart from these assumptions, we used additional analyses to examine the sensitivity of future forest conditions to general market conditions (chapter 5) and to address alternative bioenergy futures (chapter 10). In this case the Cornerstone Futures define a framework for evaluating forest product/bioenergy market possibilities. Also embedded in the Cornerstone Futures is the climate forecasted using various GCMs, including changes in temperature, precipitation, and derived potential evapotranspiration. For example, figure 2.10 displays changes in the 10-year average annual temperatures from 2000 to 2060 for Cornerstones A through D. Under Cornerstone A (A1B with MIROC) nearly the entire South is forecasted to experience an increase of at least a 1° C and the northern portions of the High Plains and Cross Timbers sections of Texas and Oklahoma are forecasted to experience 2.5-3° C increases. Other Cornerstone Futures are consistently warmer but less warm than A1B/MIROC and show greater spatial variation in temperature increases. Forecasted changes in precipitation vary across the South and across the Cornerstone Futures (fig. 2.11). Under Cornerstone A, precipitation declines across the entire region while all other Cornerstones show variation from strong declines to strong increases. These forecasts vary across the Cornerstones (figs. 2.10 and 2.11) and define variations in future growing conditions for forests across the South. They may prove important for determining wildfire impacts over the next 50 years. The use of three different GCMs in constructing the Cornerstone Futures should address potential variability in spatial distributions. More detail on climate inputs to the forecasts is contained in chapter 3. Figure 2.10—Change in average annual temperature for 10-year periods ending in 2010 and 2060 under Cornerstone Futures A, B, C, and D.
Figure 2.11—Change in 10-year average annual precipitation for 10-year periods ending in 2010 and 2060 under Cornerstone Futures A, B, C, and D.
Our use of discrete Cornerstone Futures with different climate futures does not allow for isolating the effects of climate versus all of the other driving forces behind the scenario, e.g., population or land use. The complete factorial analysis of futures based on emissions scenarios and GCMs required for this type of analysis was beyond the capacity of the Futures Project to evaluate secondary and tertiary effects. However, forest forecasts for the full factorial were the basis for the selection of the Cornerstone Futures and are described in detail in Wear and others (2013). Public meetings provided the initial input on issues needing attention in the Futures Project. These issues were further synthesized and distilled to define a set of driving factors to be examined in the course of the study. Some could not be formalized using quantitative models and have been examined as meta-issues and through science synthesis. Four driving factors could be modeled and were used to organize a set of 27 alternative futures. We reduced this initial set to the six Cornerstone Futures (shown in table 2.1 and figure 2.5) that were used to organize our forecasts of forest conditions and to evaluate long-term implications for a variety of resource values throughout this publication. In sum, Cornerstones A-D are defined by the matrix formed by intersecting low and high population and income forecasts with increasing and decreasing timber price futures as described above. Cornerstone A: High population/income growth along with increasing timber prices and baseline tree planting rates. Cornerstone B: High population/income growth along with decreasing timber prices and baseline tree planting rates. Cornerstone C: Low population/income growth along with increasing timber prices and baseline tree planting rates. Cornerstone D: Low population/income growth along with decreasing timber prices and baseline tree planting rates. These four Cornerstones use what we label baseline rates of tree planting following a harvest based on data from the Forest Inventory and Analysis Program of the Forest Service to forecast future planting. Cornerstones E and F depart from these four either by augmenting planting rates by 50 percent for Cornerstone A (E), where economic growth is strong and timber markets are expanding, or by decreasing planting rates by 50 percent for Cornerstone D (F), where economic growth is reduced and timber markets are declining. Cornerstone E: High population/income growth along with increasing timber prices and high tree planting rates. Cornerstone F: Low population/income growth along with decreasing timber prices and low tree planting rates. The six Cornerstone Futures define a broad range of potential future conditions within which forests might develop. They address the set of four change factors identified by the expert panel using public input: wood products markets, bioenergy, land uses, and climate changes. They address bioenergy and wood products markets in a qualitative fashion—through exogenously defined trajectories of timber prices—that capture a broad range of market conditions. And they address land use and climate change in a detailed and spatially explicit way through projections of population, income, temperatures, and precipitation downscaled to the county level. Thanks to those who served on the expert panel for developing alternative futures in June 2008.
for the conterminous United States at the county spatial scale using SRES scenarios A1B and A2 and PRISM climatology. Fort Collins, CO: U.S. Department of Agriculture Forest Service, Rocky Mountain Research Station. http://www.fs.fed.us/rm/data_archive/dataaccess/US_ClimateScenarios_county_A1B_A2_PRISM.shtml. [Date accessed: January 10, 2011]. Ince, P.J. ; Kramp, A.D.; Skog, K.E. [and others]. 2011. U.S. Forest Products Module for RPA forest assessment. Res. Pap. FPL-RP-662. Madison, WI: U.S. Department of Agriculture Forest Service, Forest Products Laboratory. 61 p.
Intergovernmental Panel on Climate Change [IPCC]. 2007. Climate change 2007: synthesis report. Geneva, Switzerland. http://www.ipcc.ch/publications_and_data/ar4/syr/en/contents.html. [Date accessed: January 24, 2012]. Joyce, L.A.; Price, D.T. ; McKenney, D.W. [and others]. 2011. High resolution interpolation of climate scenarios for the conterminous United States and Alaska derived from general circulation model simulations. Gen. Tech. Rep. RMRS-GTR-263. Fort Collins, CO: U.S. Department of Agriculture Forest Service, Rocky Mountain Research Station. 87 p.
Nakicenovic, N.; Alcamo, J.; Davis, G. [and others]. 2000. Special report on emissions scenarios: a special report of working group III of the Intergovernmental Panel on Climate Change. Cambridge, UK: Cambridge University Press. 599 p. http://www.grida.no/climate/ipcc/emission/index.htm. [Date accessed: March 25, 2011]. Prestemon, J.; Abt, R.C. 2002. Timber products supply and demand. In: Wear, D.N. ; Greis, J.G., eds. Southern forest resource assessment. Gen. Tech. Rep. SRS–53. Asheville, NC: U.S. Department of Agriculture Forest Service, Southern Research Station: 299-325. Price, D.T. ; McKenney, D.W.; Joyce, L.A. [and others]. 2011. High-resolution interpolation of climate scenarios for Canada derived from general circulation model simulations. Information Report NOR-X-421. Edmonton, AB: Natural Resources Canada, Canadian Forest Service, Northern Forestry Centre. 104 p.
Raunikar, R.; Buongiorno, J.; Turner, J.A. ; Zhu, S. 2010. Global outlook for wood and forests with the bioenergy demand implied by scenarios of the Intergovernmental Panel on Climate Change. Forest Policy and Economics. 12: 48-56. Sun, G.; McNulty, S.G.; Moore Myers, J.; Cohen, E.C. 2008. Impacts of multiple stresses on water demand and supply across the Southeastern United States. Journal of American Water Resources Association. 44(6): 1441–1457. Ward, J.D. ; Mistretta, P.A. 2002. Impacts of pests on forest health. In: Wear, D.N. ; Greis, J.G., eds. Southern forest resource assessment. Gen. Tech. Rep. SRS–53. Asheville, NC: U.S. Department of Agriculture Forest Service, Southern Research Station: 403-428. Wear, D.N. ; Greis, J.G. ; Walters, N. 2009. The Southern Forest Futures Project: using public input to define the issues. Gen. Tech. Rep. SRS–115. Asheville, NC: U.S. Department of Agriculture Forest Service, Southern Research Station. 17 p.
Wear, D.N. ; Huggett, R.; Li, R. [and others]. 2013. Forecasts of forest conditions in U.S. regions under future scenarios: a technical document supporting the Forest Service 2010 RPA assessment. Gen. Tech. Rep. SRS-170. Asheville, NC: U.S. Department of Agriculture Forest Service, Southern Research Station. 101 p.
David N. Wear is the Project Leader, Center for Integrated Forest Science, Southern Research Station, U.S. Department of Agriculture Forest Service, Raleigh, NC 27695; Robert Huggett is a Research Assistant Professor, Department of Forestry and Environmental Resources, North Carolina State University, Raleigh, NC 27695; John G. Greis is a Resource Specialist, Southern Region, U.S. Department of Agriculture Forest Service, Tallahassee, FL 32399.